There are three important Rock Types – Igneous, Sedimentary and Metamorphic Rocks. We will study them in detail. Feldspar and quartz are the most common minerals found in rocks. Petrology is science of rocks. Igneous Rocks — solidified from magma and lava. Sedimentary Rocks — the result of deposition of fragments of rocks. Metamorphic Rocks — formed out of existing rocks undergoing recrystallization. Formed out of magma and lava and are known as primary rocks. If molten material is cooled slowly at great depths, mineral grains may be very large. Sudden cooling (at the surface) results in small and smooth grains. Granite, gabbro, pegmatite, basalt, etc.are some of the examples of igneous rocks. There are two types of igneous rocks: intrusive rocks (Granite) and extrusive rocks (Basalt-Deccan Traps). Acid igneous rocks, such as granite, are less dense and are lighter in colour than basic rocks. Based on place and time taken in cooling of the molten matter, igneous rocks can be divided into Plutonic and Volcanic rocks. Sometimes, the molten matter is not able to reach the surface and instead cools down very slowly at great depths. Slow cooling allows big-sized crystals (large grains) to be formed. Granite is a typical example. These rocks appear on the surface only after being uplifted and denuded. These are formed by rapid cooling of the lava thrown out during volcanic eruptions. Rapid cooling prevents crystallization, as a result such rocks are fine-grained. Basalt is a typical example. The Deccan traps in the peninsular region is of basaltic origin. Basic rocks contain a greater proportion of basic oxides, e.g. of iron, aluminium or magnesium, and are thus denser and darker in colour. These rocks occupy an intermediate position between the deep-seated plutonic bodies and the surface lava flows. Dyke rocks are semi-crystalline in structure. Based on the presence of acid forming radical, silicon, igneous rocks are divided into Acid Rocks and Basic Rocks. These are characterized by high content of silica—up to 80 per cent, while the rest is divided among aluminium, alkalis, magnesium, iron oxide, lime etc.. These rocks constitute the sial portion of the crust. Due to the excess of silicon, acidic magma cools fast and it does not flow and spread far away. High mountains are formed of this type of rock. These rocks have a lesser content of heavier minerals like iron and magnesium and normally contain quartz and feldspar. Add rocks are hard, compact, massive and resistant to weathering. These rocks are poor in silica (about 40 per cent); magnesia content is up to 40 per cent and the remaining 40 per cent is spread over iron oxide, lime, aluminium, alkalis, potassium etc. Due to low silica content, the parent material of such rocks cools slowly and thus, flows and spreads far away. This flow and cooling gives rise to plateaus. Presence of heavy elements imparts to these rocks a dark colour. Basalt is a typical example, others being gabbro and dolerite. Not being very hard, these rocks are weathered relatively easily. Since magma is the chief source of metal ores, many of them are associated with igneous rocks. The minerals of great economic value found in igneous rocks are magnetic iron, nickel, copper, lead, zinc, chromite, manganese, gold, diamond and platinum. Amygdales are almond-shaped bubbles formed in basalt due to escape of gases and are filled with minerals. The old rocks of the great Indian peninsula are rich in these crystallised minerals or metals. Many igneous rocks like granite are used as building material as they come in beautiful shades. Formed as a result of denudation (weathering and erosion). These deposits through compaction turn into rocks. This process is called lithification. Cover 75 per cent of the earth’s crust but volumetrically occupy only 5 per cent. They are layered or stratified of varying thickness. Example: sandstone, shale etc. Till or Tillite == Ice deposited sedimentary rocks. Loess == Wind deposited sediments. mechanically formed — sandstone, conglomerate, limestone, shale, loess etc. organically formed — geyserite, chalk, limestone, coal etc. chemically formed — chert, limestone, halite, potash etc.. Formed by mechanical agents like running water, wind, ocean currents, ice, etc. Arenaceous rocks == More sand and big sized particles, and are hard. E.g. sandstone. Argillaceous rocks == More clay and are fine-grained, softer, impermeable and non-porous. They are easily weathered and eroded. E.g. shale. Water containing minerals evaporate at the mouth of springs or salt lakes and give rise to Stalactites and stalagmites (deposits of lime left over by the lime-mixed water as it evaporates in the underground caves. The remains of plants and animals are buried under sediments and due to heat and pressure from overlying layers, their composition undergoes a change. Coal and limestone are well-known examples. Plant remains give rise to coals of different grades depending upon the proportion of carbon and the degree of overlying pressure. The peat and lignite (brown coal) is the first stage of coal having below 45 per cent of carbon; the bituminous variety is the next stage with 60 per cent carbon. Limestone is composed of shells and skeletons of dead marine animals that once lived in shallow, warm and clear waters of a sea or lake. Depending on the predominance of calcium content or the carbon content, sedimentary rocks may be calcareous (limestone, chalk, dolomite) or carbonaceous (coal). These rocks are characterized by marks left behind by water currents and waves etc.. These rocks have fossils of plants and animals. These rocks are generally porous and allow water to percolate through them. Alluvial deposits in the Indo-Gangetic plain and coastal plains is of sedimentary accumulation. These deposits contain loam and clay. Different varieties of sandstone are spread over Madhya Pradesh, eastern Rajasthan, parts of Himalayas, Andhra Pradesh, Bihar and Orissa. The great Vindhyan highland in central India consists of sandstones, shales, limestones. Coal deposits occur in river basins of the Damodar, Mahanadi, Godavari in the Gondwana sedimentary deposits. Sedimentary rocks are not as rich in minerals of economic value as the igneous rocks. But important minerals such as hematite iron ore, phosphates, building stones, coals, petroleum and material used in cement industry are found. The decay of tiny marine organisms yields petroleum. Petroleum occurs in suitable structures only. Important minerals like bauxite, manganese, tin are derived from other rocks but are found in gravels and sands carried by water. Sedimentary rocks also yield some of the richest soils. Form under the action of pressure, volume and temperature (PVT) changes. Metamorphism occurs when rocks are forced down to lower levels by tectonic processes or when molten magma rising through the crust comes in contact with the crustal rocks. Metamorphism is a process by which already consolidated rocks undergo recrystallization and reorganization of materials within original rocks. In the process of metamorphism in some rocks grains or minerals get arranged in layers or lines. Such an arrangement is called foliation or lineation. Sometimes minerals or materials of different groups are arranged into alternating thin to thick layers. Such a structure in is called banding. Gneissoid, slate, schist, marble, quartzite etc. 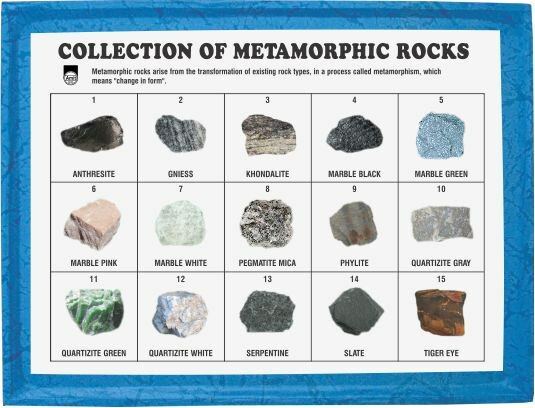 are some examples of metamorphic rocks. Such movements often take place with interplay of folding, warping, crumpling and high temperatures. These processes give existing rocks a new appearance. Lava Inflow The molten magmatic material inside the earth’s crust brings the surrounding rocks under the influence of intense temperature pressure and causes changes in them. 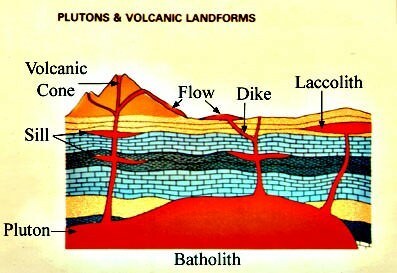 The omnipresent geodynamic forces such as plate tectonics also play an important role in metamorphism. The change of form or re-crystallisation of minerals of sedimentary and igneous rocks under the influence of high temperatures is known as thermal metamorphism. There may be various sources of the’high temperatures—hot magma, hot gases, vapours and liquids, geothermal heat etc. A magmatic intrusion causing thermal metamorphism is responsible for the peak of Mt. Everest consisting of metamorphosed limestone. As a result of thermal metamorphism, sandstone changes into quartzite and limestone into marble. This refers to the formation of metamorphic rocks under the stress of pressure. Sometimes high pressure is accompanied by high temperatures and the action of chemically charged water. The combination of directed pressure and heat is very powerful in producing metamorphism because it leads to more or less complete recrystallisation of rocks and the production of new structures. This is known as dynamothermal metamorphism. Under high pressure, granite is converted into gneiss; clay and shale are transformed into schist. The gneisses and schists are commonly found in the Himalayas, Assam, West Bengal, Bihar, Orissa, Madhya Pradesh and Rajasthan. Quartzite is a hard rock found over Rajasthan, Bihar, Madhya Pradesh, Tamil Nadu and areas surrounding Delhi. Marble occurs near Alwar, Ajmer, Jaipur, Jodhpur in Rajasthan and parts of Narmada Valley in Madhya Pradesh. Slate, which is used as a roofing material and for writing in schools, is found over Rewari (Haryana), Kangra (Himachal Pradesh) and parts of Bihar. Graphite is found in Orissa and Andhra Pradesh. Igneous rocks are primary rocks and other rocks form from these rocks. Igneous rocks can be changed into sedimentary or metamorphic rocks. The fragments derived out of igneous and metamorphic rocks form into sedimentary rocks. The crustal rocks (igneous, metamorphic and sedimentary) may be carried down into the mantle (interior of the earth) through subduction process and the same melt down and turn into molten magma, the original source for igneous rocks. Feldspar: Half the crust is composed of feldspar. It has a light colour and its main constituents are silicon, oxygen, sodium, potassium, calcium, aluminium. Quartz: It has two elements, silicon and oxygen. It has a hexagonal crystalline structure. It is uncleavaged, white or colorless. It cracks like glass and is present in sand and granite. It is used in manufacture of radio and radar. Bauxite: A hydrous oxide of aluminium, it is the Ore of aluminium. It is non-crystalline and occurs in small pellets. Cinnabar: It is mercury sulphide and mercury is derived from it. It has a brownish colour. Dolomite: A double carbonate of calcium and magnesium. It is used in cement and iron and steel industries. It is white in colour. Gypsum: It is hydrous calcium sulphate and is used in cement, fertilizer and chemical industries. Haematite: It is a red ore of iron. Magnetite: It is the black ore (or iron oxide) of iron.